John James Audubon (1785-1851) is the ornithologist, naturalist, and painter whose color-plate book, Birds of America, is considered one of the most important ornithological works ever published. 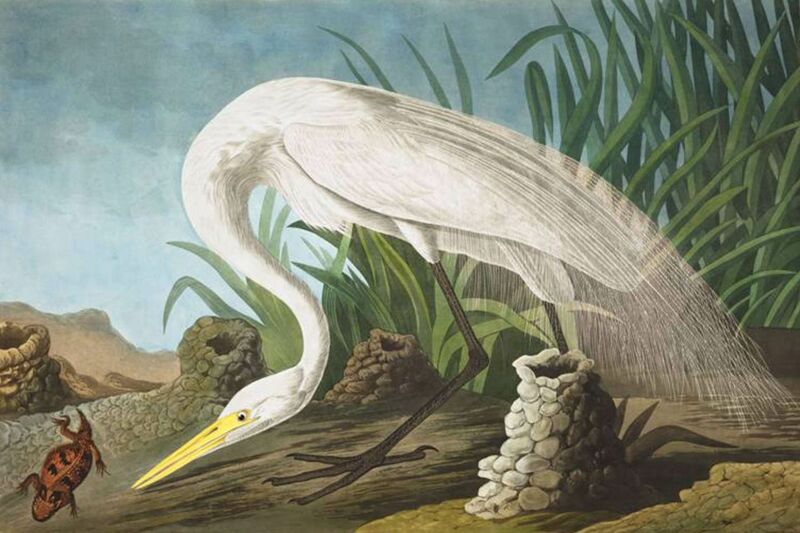 It's safe to say he would be turning in his grave if he could see the Berman Museum's "Rare Bird: John James Audubon and Contemporary Art," an exhibition organized by Berman director Charles Stainback that pairs Audubon's prints with the works of nine contemporary artists. In Audubon's time, bird species were so numerous that he was able to identify 25 new ones. In our time - the one occupied by the artists whose works are sharing the museum's galleries with Audubon - they're going the way of the dodo. Where Audubon's gorgeous images of avians celebrated their presence in the world, his fellow exhibitors mourn species they never even got to know. Humankind does not come off well in this show, especially as regards the passenger pigeon, hunted to extinction more than a century ago. Audubon did minor damage, as the exhibition makes clear from the outset, but probably only for the purpose of studying his subjects. In a vitrine in the center of the front gallery displaying Audubon's prints, among them White Heron (1857) and Eider Duck (1860), are his preserved specimens of a wood duck, a prothonotary warbler, a lazuli bunting, and a spotted towhee (courtesy of the Academy of Natural Sciences of Drexel University). Surprisingly - or not - their feathers have maintained their vivid hues since 1835. Appropriately, the only contemporary artist sharing the first gallery with Audubon is Alice Sharp, whose small, colored-pencil and graphite drawings of the feathers of various bird species common to Pennsylvania are as carefully rendered as any of Audubon's studies. This is also the only body of work in this exhibition that, like Audubon's, suggests an abundance of living species. The mood turns distinctly elegiac in the main gallery, starting with Susannah Sayler and Edward Morris' Eclipse (2014), an installation of eight vertically arranged flat-panel TV screens that nearly reaches the gallery's high ceiling and displays a black-and-white video commemorating the 1914 death of Martha, the last living captive passenger pigeon (the last living wild one is said to have been shot in 1900). The video shows a tree form whose hundreds of leaves morph into pigeonlike birds that fly away en masse, blocking the sky, leaving the tree's branches bare. It's an impressive work, both for its unusual construction and the simple poetic message it conveys about the fragility of life. Walton Ford, the only artist in the show who directly refers to Audubon, borrows his predecessor's subjects and style to create strange creatures and creepy narratives in his pencil, gouache, and watercolor paintings. Walton's Great Blue Heron (1992) is a crazed-looking bird, stomping on lizards while gobbling one down. You sense he or she is the product of some misguided human experiment. It's hard to take your eyes away from Kate MccGwire's two sculptures, meticulous arrangements of pheasant and rooster feathers on sinuous frameworks that suggest large, coiled snakes. Displayed on pedestals and covered with antique glass domes, they're an obvious nod to the Victorian penchant for collecting - but their evocation of beauty and terror immediately reminded me of Richard Avedon's photograph of Nastassja Kinski with a boa constrictor coiled around her naked body. They're unquestionably the most arresting works in this show, but they're as still as death - clearly MccGwire's point. They don't make as much of a connection to Audubon as other works in this show do, but their spellbinding uncanniness makes up for it. There is some humor here, mingled with sadness. Duke Riley's project Trading With the Enemy aligns nicely with Audubon's undaunted, enterprising spirit. Riley, an artist and pigeon fancier, trained homing pigeons to fly from Key West to Havana to pick up cigars and bring them back, and recorded their successes and failures in a film and in bas-relief painted portraits of his minions, some of whom died while on duty. Riley's painting style is primitive, but his exuberance is infectious. "Rare Bird: John James Audubon and Contemporary Art" also includes works by Brandon Ballengée, Harri Kallio, Nina Katchadourian, and James Prosek. Through April 3. From 11 a.m. to 4 p.m. Tuesdays through Sundays, at Berman Museum of Art at Ursinus College, 601 E. Main St., Collegeville. Information: 610-409-3500 or www.ursinus.edu/berman. It's always fun to see new art and photography books, and the Print Center is offering a look at the latest photography monographs, accompanied by the photographs that fill them, in "By the Book: Recent Photography Publications." Here, among other efforts, are photographs by David Hartt shot inside the Chicago-based Johnson Publishing Co. (Jet, Ebony) and the ensuing book, Stray Light; Justine Kurland's photographs made in response to poems by the art critic John Yau, collected in the book Black Threads From Meng Chiao; and Deadline, Will Steacy's five-year-long project documenting the newsroom and printing plant of the Inquirer, culminating in the most inventive of the publications here, a facsimile of an Inquirer-like newspaper featuring photographs of the interior of the Inquirer Building on North Broad Street and its employees, plus articles written by the Inquirer's staff for Steacy's project. Through April 23. Print Center, 1614 Latimer St., 11 a.m. to 6 p.m. Tuesdays through Saturdays. 215-735-6090 or www.printcenter.org.